The Dave Wood Interpretive trail, aka Simms Mesa Loop, is located in the Plateau Division of the Uncompahgre National Forest near Montrose, Colorado. 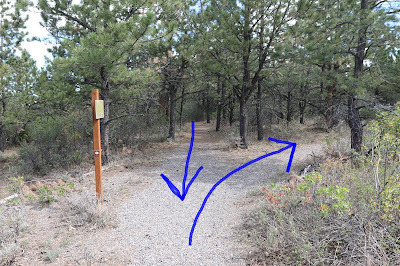 The trail begins at the Forest Service boundary on the Dave Wood Road where it follows a scenic loop that leads it through thickets of oakbrush and tall stands of ponderosa pines. The trail is interpretive in nature with numbered posts along the way that point out a variety of aspects about the areas environment. A trail guide is available online from the Forest Services website to print out and take along. To get to the trailhead follow the Dave Wood Road for about 15 miles from Montrose. The trailhead is on the left side of the road immediately after crossing the Uncompahgre Forest boundary. The trail follows a smooth graveled path that should be suitable for baby strollers. Numbered post along the trail correspond to points in the brochure. As the trail descends into an open area it comes to a fence that has a walk through that is designed to keep livestock out. From there the trail is well concealed as it passes through a thicket of oakbrush. The oakbrush gives way to sagebrush as the trail comes to the start of the loop. To keep in order with the numbered posts follow the trail to the right. At this point the trail is traveling through a forest of pines with very little undergrowth. 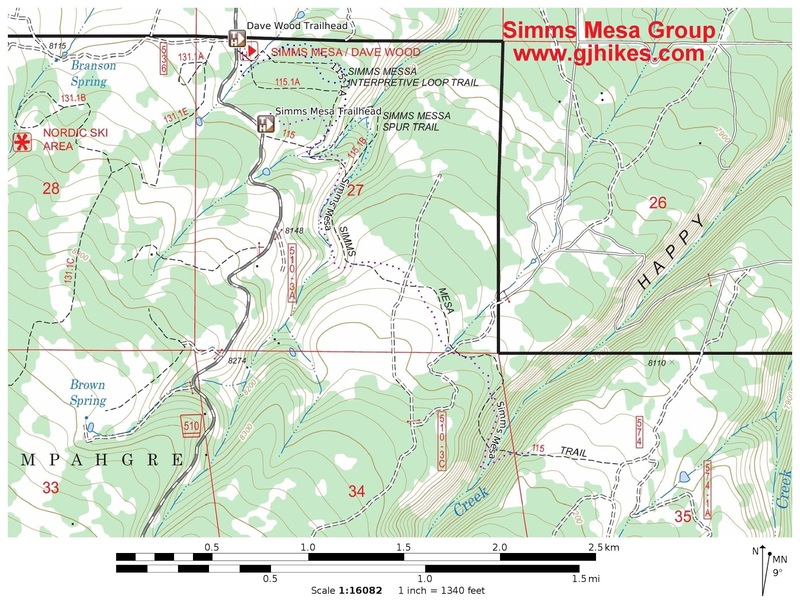 At the 0.6 mile point there is a junction where the Simms Mesa Loop Connector trail branches off on the right. 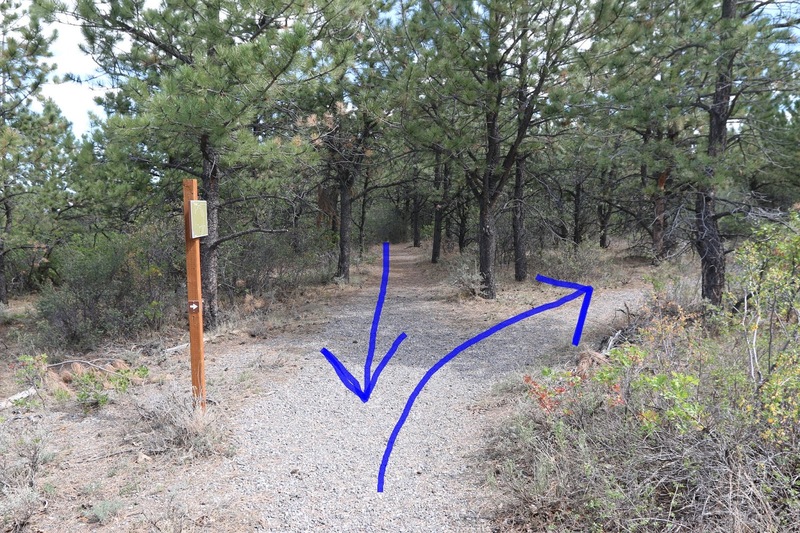 The connector is a quarter mile long trail that joins the interpretive trail with the Simms Mesa trail. The forest provides a peaceful setting as the trail loops back toward the trailhead. The Dave Wood Interpretive trail is a good option for families with small children to enjoy a hike together and learn a few things about the forest ecosystem. The brochure includes a nice map to go along with the Interpretive trail. 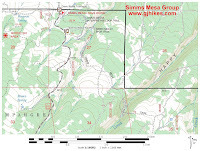 For those that would like to extend the hike to include all or part of the Simms Mesa or Aspen Grove trails we would suggest that you also take along the map that we have included. If you would like to see it for yourself then all you have to do is 'Take a hike'.